Ya Jagoff!!! 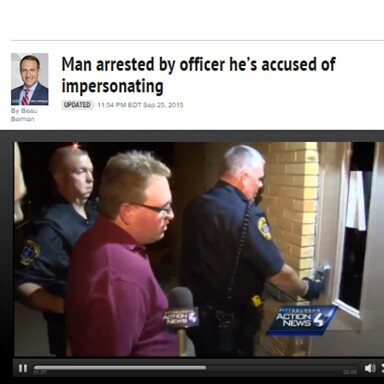 | So, Why NOT Impersonate a Police Officer? Home Criminal Jagoffs So, Why NOT Impersonate a Police Officer? So, Why NOT Impersonate a Police Officer? In the picture above is Justin #1 (burgundy shirt) and Justin #2, police officer holding on to Justin #1. As it turns out, Justin #1 ALLEGEDLY got on line and met with a woman saying he was a police officer…and not just ANY police officer. He said he was police officer, i.e, #Justin #2. All of this took place in the tiny little town of Mount Pleasant Borough.. total population.. um… some number small enough that pretty much everyone knows everyone else. Ya know, a perfect place to impersonate someone from the same town (allegedly). See story on WTAE website. At press time, our SJIU (Special Jagoff Investigative Unit) had not confirmed if the suspect was in possession of one of those big rolls of sticker “Junior Police Officer” badges at the time of his arrest. C’mon #Justin #1… don’t you watch the TV? The standard trendy response that would make sense would be “I will be vindicated once ALL of the information comes out.” That’s like in the free defense tips 101 handbook for crissakes! Well, looks like ya got some time to think about what your Halloween costume is going to be this year. Think you’ll go as a cop… or maybe even a slutty cop? Dude…just guarantee us that, with that physique, you don’t go as the Village People cop! I mean, I’m no Ken Doll with my physique BUT, you half naked in a Village People cop outfit would be even a more heinous crime…especially if someone would have had to review the pictures. Seems, with that physique, you COULD impersonate a male stripper though.. TRAGIC MIKE! Good luck impersonating a prisoner, Ya Jagoff! Previous articleYakkin’ With YaJagoff – Comedians: Owen Benjamin, Ahmed Ahmed, Roy Wood, Jr.